This is what my stats looked like shortly after 11:00 last night. (Yep, I use the old stats page. The new one doesn’t give you this snapshot of “context.”) This morning I’m back on track to my usual numbers, lucky to break 100 views in a day. That “best ever” day of 581 was also a fluke, just like yesterday—although more legitimate. That was the day, shortly after I’d started blogging, that my “Jonah Lehrer, and the ‘marvellous Boy'” post was Freshly Pressed. At least people who came to my blog that day were actually interested in reading what I’d written! 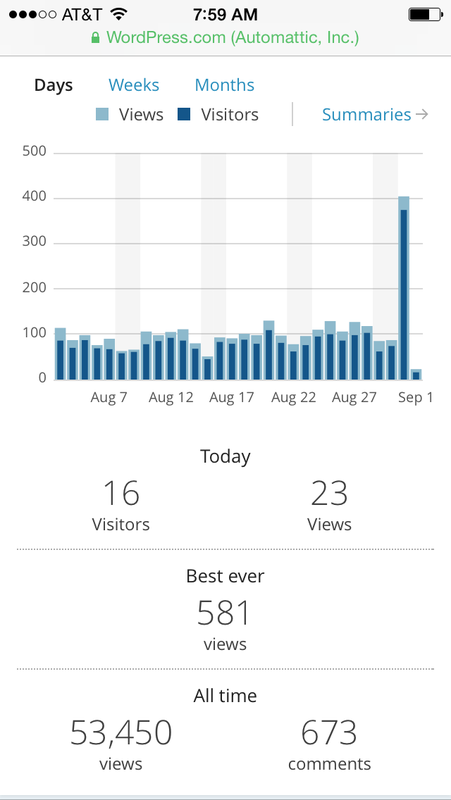 I have a feeling that people who came to my blog yesterday immediately clicked away again once they’d discovered their mistake. About mid-morning I noticed something strange. A post I’d written last December about how Ohio State football coach Urban Meyer teaches like a humanities professor (see it here) was suddenly getting more views than my usual heavy hitter, “What’s the difference between grammar, punctuation, and mechanics?” Odd, but with the start of school and football season, possibly someone had stumbled across it and maybe shared on Facebook or something? Then my stats really started to explode. It seemed I was getting several new views every minute. I decided I’d better go look at that post to make sure any links I’d put in were still current. They were, but I put an “update” paragraph at the end, telling people that one of the blogs I linked to now had some kind of ad to sign up for an electronic newsletter that might dissuade them from reading that particular discussion. Oh, well. It was fun while it lasted! This entry was posted in Writing, blogging and tagged blog stats, blogging, fluke, luck, Urban Meyer. Bookmark the permalink. Oh, how fun! I love little stats mysteries like that. Glad you were able to figure it out. Hopefully some people actually read the post and learned something enjoyable!